This article originally appeared in The Curator, September 25, 2009. When my husband and I started to discuss where to look for a house, our preferences did not quite align. Johnny leaned toward the affordable suburbs of Katy, and I presented an unrealistic argument for a pricey, historic bungalow in one chamber of the heart of Houston — the Woodland Heights, our church’s neighborhood. My husband’s practical wisdom prevailed, and walking into the two-story house in which we now live, we experienced the surprisingly truthful cliché: we just knew. I made it my mission to see the suburbs as I now see everything: to seek out what is rehumanizing right here, chain stores and all. Our neighborhood is very walkable, most of our neighbors are friendly, and we consider Cedar’s Mediterranean Grill & Market “our place,” offering the best hummus, hookahs, and Arabic music videos on the TV. We now feel as if the ‘burbs are home sweet home. However, if we win the lottery, we might be persuaded to move to one of those bungalows. Until that improbable day, my urban aesthetics are assuaged by driving to church every Sunday through the absence of notorious Houston traffic — it’s like God’s gift to the faithful. As creatures of ritual and pleasure, our Sabbaths consist of a geographical trinity to which we migrate like birds to their homeland. We both work from home, so Sunday is our earliest day of the week. I am not a morning person. But, gratefully, Antidote Coffee is our first stop, its atmosphere just buzzed enough to gently wake fellow grumpy, slow risers. Cheery, multi-colored patio furniture awaits outside, and eclectic vintage furniture inside. Red brick walls sport local art and photography. The menu offers organic and fair trade coffee roasted in Marfa, Texas; organic artisanal tea, beer, wine, homemade baked goods, watermelon gazpacho, red bean hummus, and other delights. Happy hour includes spirits, of course, but also $1.00 espresso shots. The Beach Boys, The Kinks, and Old Country play overhead. They spin bad music at times, too, but at least it’s obscure bad music. The staff is attentive and kind — by now they know that Johnny takes his cappuccino wet with organic milk; they wait patiently as I rummage through the tea selection indecisively. It’s a small, intimate space. I can’t help but eavesdrop on most conversations as they bounce off the stained concrete floor. And there’s no finding a secret, introverted nook in which to work or read. As I select a small wooden table or a velvet couch, I often have to ask a person, “Is this seat taken?” One afternoon, I poured my teapot of organic breakfast tea and spilled some of it in the process — very characteristically of me. A soft-spoken man chuckled in sympathy and asked what I was drinking, or spilling. I asked the same of him (Sencha green) and we oohed and ahhed over varieties of white tea, as well as our mutual preference for dark roast and chicory coffees. I discovered that he was born in France, adopted by an American family, and is now part of both families — he visits the French countryside regularly. I shared that my mom was adopted; her biological family is from Louisiana, and she, too, is part of both families. And when I said that just that morning, Johnny and I daydreamed of visiting Paris, the man said, “Oh, you should — there’s still a lot of magic in that city.” I marveled at this conversation with a kindred spirit-stranger. 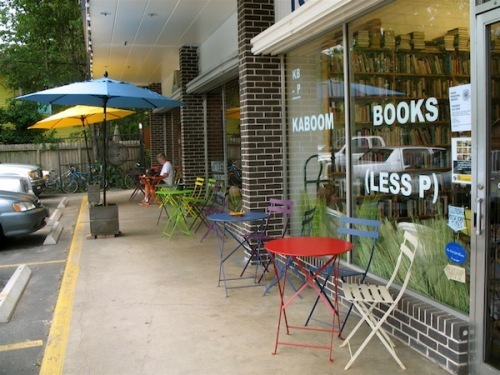 Kaboom Books is right next door, a brilliant pairing. More rainbow-hued tables and chairs adorn the storefront, encouraging the enjoyment of coffee and used books here or there. The second Kaboom location is a little bigger and five minutes away, and our church is situated in the middle. The owners are a good-natured married couple, transplants from New Orleans after Katrina. We met the spunky red-haired wife, newly a Houston resident, and to our delight and surprise, she reported that they love their new hometown and neighbors. I am not above a Barnes & Noble/Starbucks combo, but I do have a special place in my heart for the unshakable independents in our culture, and for the smell of old books. Kaboom’s tall, crude wooden shelves hold more mystery than a polished new store. Their selection musters up a literary faith in the face of uncertainty. Lately, I believe that I will find Wendell Berry’s Hannah Coulter on that high shelf with the B’s, though I cannot yet see it. Like the old bungalows in the neighborhood, these books spin yarns and tall tales to complement the story their pages hold. The front page might bear a reader’s name written with pencil or ink, provoking a sort of reverence in me as I flip through the pages, as if that long-lost soul is loaning it to me. Kaboom opens later than Antidote on a Sunday morning, so I wistfully peek into my dusty little sanctuary until I can step inside again. Sometimes we do so after church, or during the week. Our liturgy of the neighborhood is not just for the Sabbath, you see. We hop in the car with to-go cups of caffeine and weave down Euclid Street for two minutes toward church. This neighborhood provides something suburbanites should cultivate: a deeper sense of community and beauty, which naturally pours into my soul as I spy porch swings, rocking chairs, hammocks, wind chimes, lush gardens bright with flowers, protective oak trees, and quirky art sculptures planted in front yards. The amicability also speaks from the bungalow architecture itself, with most homes boasting wide front porches that make hospitality visual. Friends drink wine on those shady havens in the evening, or sleepy-eyed fathers enjoy breakfast in solitude the next morning. History resides in these streets as well — old, tattered bungalows sit alongside newer models, but the Woodland Heights is committed to preserving "a hometown near downtown since 1907" and beautiful American Craftsman design. Change is good at the right time, but I still admire this small town within the big city, one determined to conserve historical architecture which tells a large part of Houston’s story. The impetus for our Sabbath migration sits on the corner of Beauchamp and Byrne: Church of the Holy Trinity, a small Anglican parish. “Worship is primary theology. It is also home, which, as the saying goes, is the place where they have to take you in” (Kathleen Norris, Amazing Grace). I grew up with Baptist mega-church roots, and so our little liturgical church feels exactly like our second family (after in-laws) with differences, squabbles, hugs, laughter, shared tears and joy, and all the rest. I actually know my priest — a far cry from a distant pastoral association, with a stage and bright lights. Fr. Doug loves local coffee shops, whiskey, good tobacco, the Coen Brothers, John Donne, Wendell Berry, and slow food, just for starters. The liturgy suits people like me and Johnny, and many in the congregation — the artful-minded, craving visuals and symbols. We walk in the door to dip our fingertips in cold, holy water; trace a cross from our forehead to our chest; light a candle cupped in red glass to symbolize prayers weighing heavy on our hearts. I take a wooden pew under the St. Catherine of Alexandria stained glass. There is a still, sweet reverence under the wooden nave which looks like an upturned ark, drying out from a tragic flood. As we do “the people’s work” in peaceful repetition — kneeling, bowing, crossing — we embed Scripture and worship into our souls and movements. Liturgy is found in the pages of Genesis, the 1st century early church, and onward until now — more history rooted within a bustling, modern city. The music is both traditional hymns and new songs on guitar, piano, and djembe. Candles light the altar; incense tickles our noses and represents our collective prayers. When we walk out the door and gather on the patio, some smoke a cigar and others grab a Shiner (on tap in the kitchen). We adults sweat in a Houston summer, and the kids run helter-skelter on the playground. We take our worship back out into the old-and-new-bungalowed neighborhood — as they welcome us, we hope to welcome them into our home the next week, signaled by church bells sounding through the ‘hood. Urbanites seek refuge from the traffic and workweek cacophony, and our activities are almost unconscious liturgical repetitions. We work with our hands in our home or in an office, completing similar tasks over and over again. We frequent our favorite places to eat, drink, and refuel. We are created to gravitate to rhythm, order, beauty, and our incarnational five senses. Or perhaps we rebel against these forces, our fallen dance. But we are to live within our culture, our eyes roving for what is true, good, and beautiful — such as the Menil neighborhood, houses of art which continue to nourish and protect me. But even more nourishing and protective is our church, Antidote’s small town hospitality, and Kaboom’s cozy inspiration — making the Woodland Heights our second neighborhood. It’s like Isaiah said: “In returning and rest you shall be saved; in quietness and in trust shall be your strength.” And so we drink coffee and tea, read, and worship; return to our suburban neighborhood, rest, repeat — revisiting the rhythm of our Bayou City Sabbath after Sabbath, a world that ought to be, without end, amen.